Market segment structure does not have to be obvious, but should nonetheless be straightforward and actionable. Useful market segments consequently could be other than demographic combinations, but not complex clusters. The following analyses illustrate some of the various segmentation approaches that were investigated by Biosite, and presented at its 2006 Investor R&D Conference. In addition to the “usual suspect” of hospital bed size, the chart below shows and number of respondents (surveyed randomly) in each of two other potential segments. 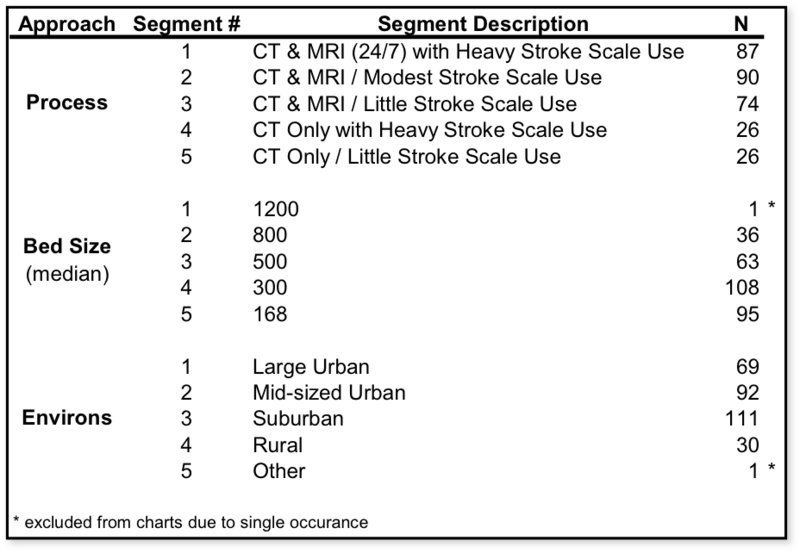 One was based on the environs of the hospital (e.g., rural or urban), and the other on imaging availability combined with use of stroke scales (process). The segments chosen were to be usable for both downstream marketing, as well as upstream product development. As all respondents to the survey had CT Scanners (imaging), an important element investigated was the percent of hospitals in a segment that had MRI imaging available This became part of the definition for the process segmentation approach. The combination of these characteristics is shown in all figures. The most important important aspect of the segmentation is related to the actual time to diagnose patients. This is a function of the combination of factors shown below—such as the stroke scale examination, neurology consult, imaging, and work shift. One can see in in the diagram below that these times vary greatly in the process segmentation. Also, this variation is caused by different aspects of timing. The cohesive nature of the segmentation, and its foundation, make it actionable. Significantly, this segmentation also meets the criterion of usefulness for both marketing and R&D. 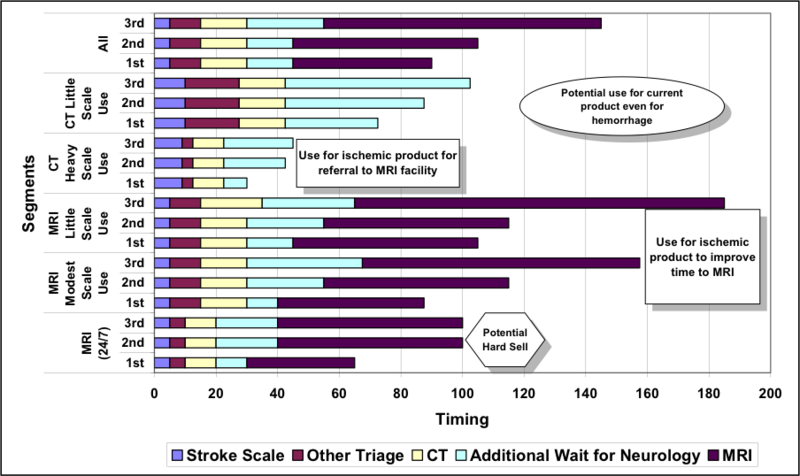 One could hypothesize where a stroke test might find its best initial reception (e.g., CT imaging only, with little use of stroke scales), types of approaches to selling the product, and customer needs for developing future products. This final analysis displays the market segment sizes derived from the segmentation. 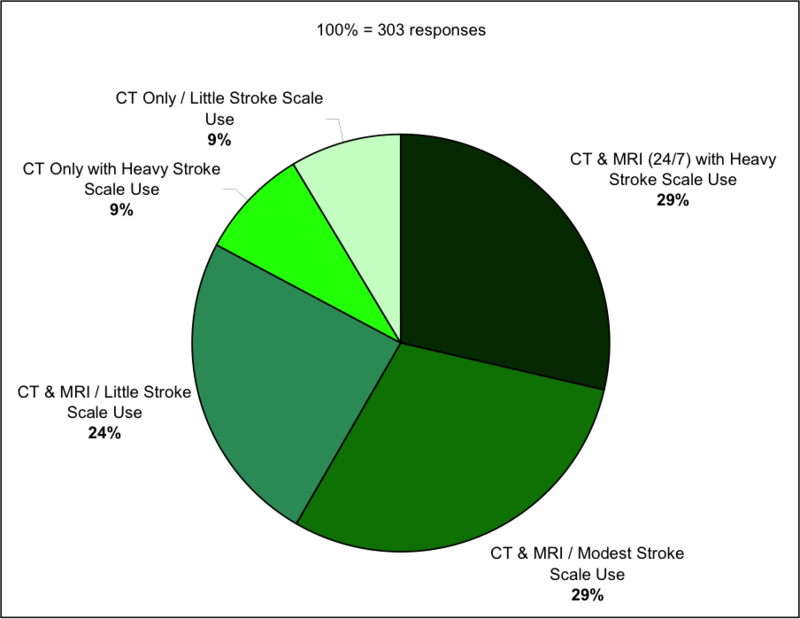 The practical addressable market size can be determined using the proportions in the chart, adjusted for the total hospital market, which may vary somewhat from the survey. There were many more analyses in this segmentation example, which contributed to the overall picture and conclusions. However, the key aspects related were conveyed to highlight the usable process segmentation versus demographic or cluster-analysis segments. Biocentury, Bloomberg and Bloomberg TV, Boston Herald, CBS Market Watch, Chicago Tribune, CNBC TV, Dow Jones, Forbes, In Vivo, Investor’s Business Daily, MSNBC TV, Nature, New York Times, PBS, Reuters, San Francisco Chronicle, SmartMoney.com, TheStreet.com, USA Today, Wall Street Journal, Washington Post. Diagnostics, Life Science, and Biotechnology Consulting for Investors, CEOs, and Functional | Department Heads. Expertise is in strategy, corporate and business development, marketing and financial assessments, and innovation. I provide sophisticated quantitative and qualitative analysis, backing strategically sound scenarios and recommendations. This is based on deep real-world experience, and an ability to quickly assess technologies and markets. I have a knack for cutting through complex problems with specific, fact-based solutions.